There are all different classifications of garages to choose from. These range from a simple carport built of rotting wood that might tip over at the slightest blow of the breeze, to million dollar garages that are present in the homes of those who have money to burn. Although these million dollar garages can have anything they want, there are a few elements that are common, if not, in some cases, necessary for the place. Depending on what you want to store in your extravagant garage, investing in these is a priority. Depending on the interests of the owner, some may invest in an expensive garage for the benefits it has for their car. The first advantage is directly related to the size. Unless the floors and walls are pure gold, a million dollar garage is generally going to have much more room to maneuver than any other. The most avid car collector can fit his prized Mustangs, Lamborghinis, and Aston Martins inside this garage. For those who wish to store their car collection in their garage, it is not only about the size of the garage, but the materials used inside. Most of these lavish rooms have nicer floors inside than the average American. Everything from the floors to the crystal chandelier on the ceiling screams sophistication. One of the most famous million dollar garages is owned by 50-Cent. Pictures prove that the room he has been known to store his cars in is grand enough to rival some Vegas nightclubs. He has been known to collect some of the most expensive cars, and keeps them in an ideal environment. When storing so many vehicles, things can be tight, even in the largest of garages. Because of this, certain features may be added to the design to make it easier to maneuver some cars in while directing others out. It is not uncommon in these expensive garages to have a turntable in the middle of the room. This way, rather than backing all the way in and out, the car can be turned the direction the owner wants it to go. This makes things easier to handle, and adds even more to the value of the home. No matter what you choose to do, these are essential in a million dollar garage. They will bring you many benefits. The garage is most likely large enough to house multiple functions at one time. 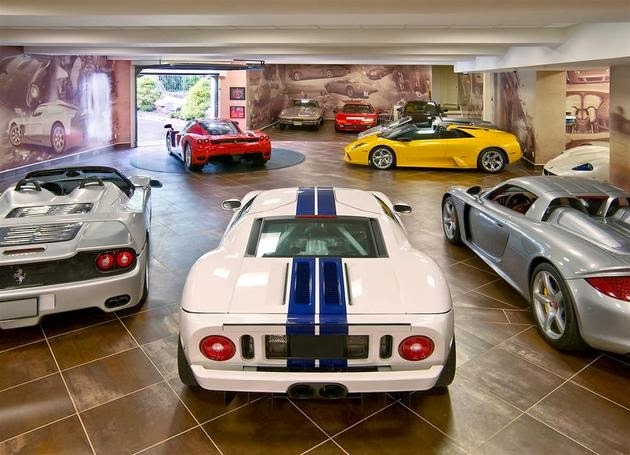 Forbes has released a list of the most amazing and expensive garages known. These structures are extravagant beyond belief, and would easily fit multiple regular sized structures, even entire homes inside. In Arizona, a garage placed inside a home worth almost $25 million is packed with vintage gas pumps and other features that represent the 1950s. This garage is extreme, but not the most extreme. In Tennessee, a home worth $38 million is one of the most expensive garages available. Inside, it is possible to comfortably park 20 cars. There are many more million-dollar garages around the neighborhood than we may not even realize. Each comes with its unique features that make it valuable to the owner. Cassie Costner has researched the most extravagant garages in the Salt Lake valley. Cassie works closely with www.utahgaragedoors.net about how to find the new garage door that will give your home the look you want.